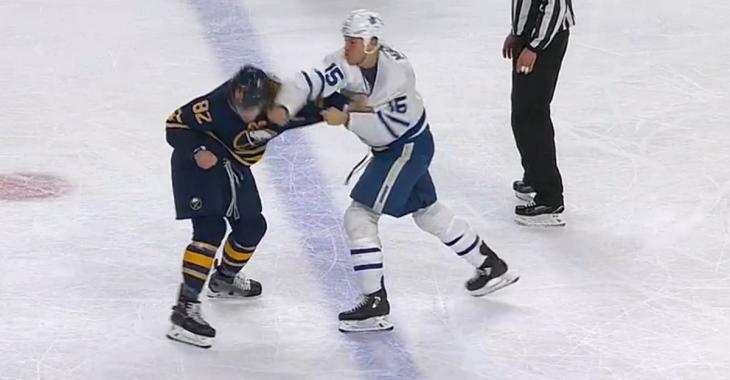 Videos : Beaulieu and Martin rock each other with big punches. Beaulieu and Martin rock each other with big punches. Great back and forth fight. We got a great back and forth fight early on on Thursday night in the National Hockey League and it featured at least one unexpected participant showing off some real toughness. The Toronto Maple Leafs were taking on the Buffalo Sabres on Thursday night and early on it looked like it was going to be a very rough night for the Buffalo Sabres, and it may still prove to be after it's all said and done. The Leafs jumped out to an early 2 - 0 lead and the Sabres, who had been off for several days, were definitely showing signs of rust on the ice. The Sabres looked shell-shocked by the early onslaught of the Leafs and with the Maple Leafs stretching the ice with their speed and passing ability it looked like the Sabres simply could not match their pace. That's when veteran defenseman Nathan Beaulieu decided to step up and ignite a fire under his team, and boy did he ever. Beaulieu, who is not known as a fighter in the NHL, went after the biggest dog in the yard when he stepped up to Toronto Maple Leafs veteran forward Matt Martin and challenged him to a fight. Martin, unlike Beaulieu, is a very experienced fight in the NHL and is widely regarded as one of the toughest customers when it comes to that aspect of the game. What ensued was an excellent fight between the two men, one in which it looked like for a moment that Nathan Beaulieu was about to shock the world with his performance. As the two men measured each other the tension was palpable and as soon as they got a hold of one another it was clear that both guys had bad intentions in this fight. Both men began to throw wild punches at one another, huge swings that began all the way back behind them and exploded forward as they swung their arms, hips and really their entire bodies into each punch. While it looked like both men were managing to graze one another it was when Beaulieu landed a huge punch that the Buffalo crowd at the First Niagara Center truly got up and on their feet. A series of huge right hands from Beaulieu actually managed to buckle Martin down to one knee, and at least for a moment it looked as if Beaulieu was about to pull off the shocking upset over one of the NHL's toughest enforcers. The Sabres bench was also going wild at this point, but unfortunately for the Sabres and their fans Martin showed just how tough he really is. Despite being buckled down to one knee, and despite the fact that Beaulieu was still hammering him in the face with heavy punches, Martin unbelievably managed to make it back to his feet. Once Martin was back up it became clear that he was in full control of the fight and he landed several heavy punches of his own to the head of Beaulieu. Those punches buckled Beaulieu down to the ice and unlike Martin he wasn't getting back up. An excellent fight from both men.